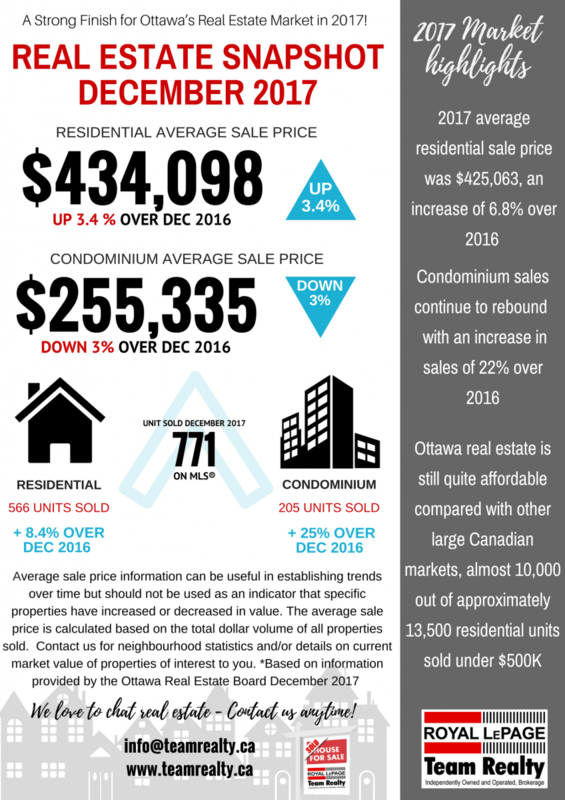 2017 was quite a year in the Ottawa Real Estate market; record breaking numbers in units sold (condominium sales up over 22%) and double digit (percentage) increases in average sale price in several neighbourhoods, Canada 150 (or should we say Ottawa 150?!) was anything but average! 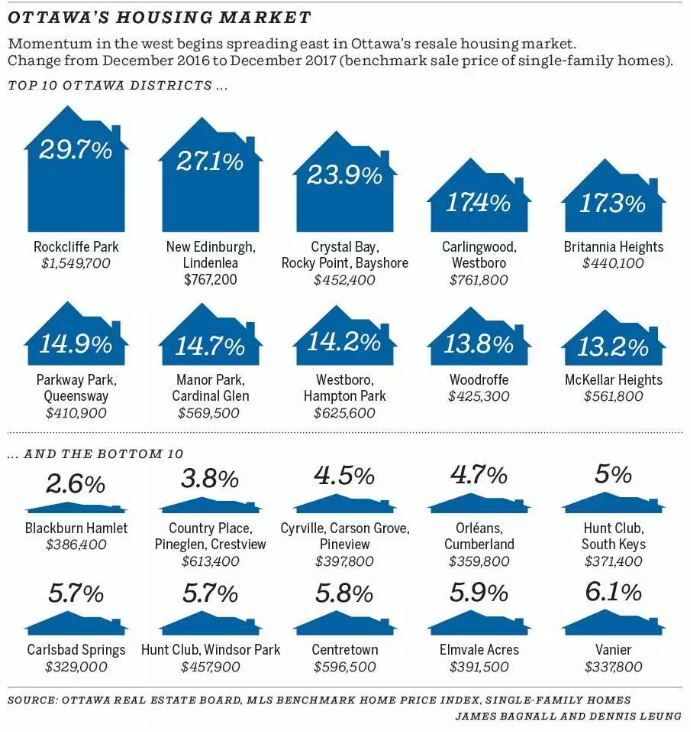 Below we’ve included the latest news release from the Ottawa Real Estate Board. Please note: average sale price information can be useful in establishing trends over time but should not be used as an indicator that specific properties have increased or decreased in value. The average sale price is calculated based on the total dollar volume of all properties sold. We have access to current statistics and trends in our neighbourhoods and communities, it’s our job to stay on top of the market trends! We have up to date Real Estate Market Reports readily available for you and we love to chat real estate – contact us anytime! Members of the Ottawa Real Estate Board sold 771 residential properties in December through the Board’s Multiple Listing Service® System, compared with 711 in December 2016, an increase of 8.4 per cent. The five-year average for December sales is 687. December’s sales included 205 in the condominium property class and 566 in the residential property class. The average sale price of a residential-class property sold in December was $434,098, an increase of 3.4 per cent over December 2016. The average sale price for a condominium-class property was $255,335, a decrease of three per cent from December 2016. “December saw an increase of 8.4 per cent in the number of units sold in residential sales and 25 per cent in condo sales. This could very well be attributed to the changes in the mortgage qualification rules implemented January 1, 2018,” speculates Ralph Shaw, 2018 President of the Ottawa Real Estate Board. The total number of residential and condo units sold through the Board’s MLS® System throughout all of 2017 was 17,083, compared with 15,526 in 2016, an increase of ten per cent. Overall, residential sales volume was up 16 per cent. 2017’s average residential sale price was $425,063, an increase of 6.8 per cent over 2016, while the average condominium sale price was $269,903, an increase of 3.4 per cent over 2016. The Board cautions that average sale price information can be useful in establishing trends over time but should not be used as an indicator that specific properties have increased or decreased in value. The average sale price is calculated based on the total dollar volume of all properties sold.